Jenderal Fazlollah Zahedi, dilantik menjadi perdana menteri oleh Mohammad Reza Shah Pahlavi. Monarki meningkatkan hubungan kekuasaan dengan pemerintahan terpilih. Kudeta Iran 1953, yang dikenal di Iran sebagai kudeta 28 Mordad (bahasa Persia: کودتای ۲۸ مرداد), adalah pelengseran Perdana Menteri Mohammad Mosaddegh dalam rangka memperkuat kekuasaan monarki Mohammad Reza Pahlavi pada 19 Agustus 1953, yang disertai oleh Britania Raya (dengan nama "Operasi Boot") dan Amerika Serikat (dengan nama Proyek TPAJAX). Setelah kudeta tersebut, Shah memerintah sebagai penguasa untuk 26 tahun berikutnya ketika memodernisasikan negara tersebut menggunakan pembaharuan minyak, sampai ia dilengserkan dalam Revolusi Iran pada 1979. ^ Steven R. Ward (2009). Immortal: A Military History of Iran and Its Armed Forces. Georgetown University Press. hlm. 189. ISBN 978-1-58901-587-6. Diakses tanggal 16 July 2013. ^ CLANDESTINE SERVICE HISTORY: OVERTHROW OF PREMIER MOSSADEQ OF IRAN, Mar. 1954: p iii. ^ Ends of British Imperialism: The Scramble for Empire, Suez, and Decolonization. I.B.Tauris. 2007. hlm. 775 of 1082. ISBN 9781845113476. ^ Bryne, Malcolm (18 August 2013). "CIA Admits It Was Behind Iran's Coup". Foreign Policy. ^ Kinzer, Stephen, All the Shah's Men: An American Coup and the Roots of Middle East Terror, John Wiley and Sons, 2003. Elm, Mostafa. Oil, Power and Principle: Iran's Oil Nationalization and Its Aftermath. (Syracuse University Press, 1994) ISBN 978-0-8156-2642-8 Documents competition between Britain and the United States for Iranian oil, both before and after the coup. Publishers Weekly summary: "an impressive work of scholarship by an Iranian economist and former diplomat [showing how] the CIA-orchestrated coup, followed by U.S. backing of the dictatorial Shah, planted"
Farmanfarmaiyan, Manuchihr, Roxane Farmanfarmaian Blood and Oil: A Prince's Memoir of Iran, from the Shah to the Ayatollah (Random House 2005.). A cousin of Mosaddeq, Farmanfarmaiyan was the Shah's oil adviser. Sympathetic to the Shah and antagonistic to Khomeini, Farmanfarmaiyan offers many insider details of the epic battle for Iranian oil, both in Iran's historic relationship with Britain and then, after the coup, with the United States. Gasiorowski, Mark J. U.S. Foreign Policy and the Shah: Building a Client State in Iran (Cornell University Press: 1991). Traces the exact changes in U.S. foreign policy that led to the coup in Iran soon after the inauguration of Dwight D. Eisenhower; describes "the consequences of the coup for Iran's domestic politics" including "an extensive series of arrests and installation of a rigid authoritarian regime under which all forms of opposition political activity were prohibited." Documents how U.S. oil industry benefited from the coup with, for the first time, 40 percent post-coup share in Iran's oil revenue. Gasiorowski, Mark J. (August 1987). "The 1953 Coup D'etat in Iran". International Journal of Middle East Studies. 10 (3): 261–286. JSTOR 163655. Kapuscinski, Ryszard (1982). Shah of Shahs. Vintage. ISBN 0-679-73801-0. Kinzer, Stephen (2003). All the Shah's Men: An American Coup and the Roots of Middle East Terror. John Wiley & Sons. ISBN 0-471-26517-9. Kinzer, Stephen, Overthrow: America's Century of Regime Change from Hawaii to Iraq (Henry Holt and Company 2006). ISBN /9780805082401 Assesses the influence of John Foster Dulles on U.S. foreign policy. "Dulles was tragically mistaken in his view that the Kremlin lay behind the emergence of nationalism in the developing world. He could... claim consistency in his uncompromising opposition to every nationalist, leftist, or Marxist regime on earth." Roosevelt, Kermit, Jr. (1979). Countercoup: The struggle for the control of Iran. McGraw-Hill. ISBN 978-0-07-053590-9. Wilber "Clandestine Service History: Overthrow of Premier Mossadeq of Iran, Nov. 1952 – 1953" [CIA] CS Historial Paper no. 208. March 1954. Behrooz, Maziar (August 2001). "Tudeh Factionalism and the 1953 Coup in Iran". International Journal of Middle East Studies. 33 (3): 363–382. doi:10.1017/S0020743801003026. JSTOR 259456. 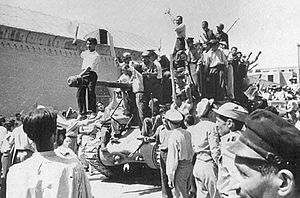 Wikimedia Commons memiliki media mengenai 1953 Iranian coup. "'Clandestine Service History—Overthrow of Premier Mosaddeq of Iran—November 1952 – August 1953'". Diarsipkan dari versi asli tanggal 8 June 2009. Diakses tanggal 6 June 2009. Halaman ini terakhir diubah pada 4 April 2017, pukul 09.30.